Below are common attributes associated to Flutterby Grande Sweet Marmalade Butterfly Bush. Become a care taker for Flutterby Grande Sweet Marmalade Butterfly Bush! Below are member comments regarding how to plant Flutterby Grande Sweet Marmalade Butterfly Bush. No comments have been posted regarding how to plant Flutterby Grande Sweet Marmalade Butterfly Bush. Be the first! 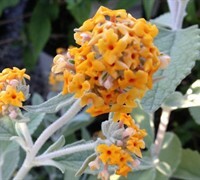 Do you know how to plant Flutterby Grande Sweet Marmalade Butterfly Bush? Below are member comments regarding how to prune Flutterby Grande Sweet Marmalade Butterfly Bush. No comments have been posted regarding how to prune Flutterby Grande Sweet Marmalade Butterfly Bush. Be the first! Do you know how to prune Flutterby Grande Sweet Marmalade Butterfly Bush? Below are member comments regarding how to fertilize Flutterby Grande Sweet Marmalade Butterfly Bush. No comments have been posted regarding how to fertilize Flutterby Grande Sweet Marmalade Butterfly Bush. Be the first! Do you know how to fertlize and water Flutterby Grande Sweet Marmalade Butterfly Bush? Below are member comments regarding how to deal with Flutterby Grande Sweet Marmalade Butterfly Bush's pests and problems. No comments have been posted regarding how to deal with Flutterby Grande Sweet Marmalade Butterfly Bush's pests and problems. Be the first! Do you know how to deal with pests and problems with Flutterby Grande Sweet Marmalade Butterfly Bush? Looking for Flutterby Grande Sweet Marmalade Butterfly Bush? Plant Butterfly Bush in full sun to light shade and well-drained soils. Butterfly Bush do not require yearly pruning however can be pruned all the way back to short 6 to 12 inch stumps at the end of winter. I feed my butterfly bushes in spring with an organic flower food. These plants are not heavy feeders. Constantly wet or soggy soil would be a problem.